The state of health and health care in Africa is influenced in a dramatic way by the continent’s poverty. Hospitals, clinics, trained medical personnel, and needed medicines are all in short supply, and available resources are often too far away or too expensive for the average African. These realities have shaped the organization and functioning of health care systems in most African nations. Although still primarily a rural agricultural society, Africa is making the transition to an urban industrial one. This shift has been accompanied by social, cultural, lifestyle, and dietary changes that have had an effect on people’s health. Infectious diseases continue to take a large toll on the population, but at the same time illnesses related to lifestyle, such as cancer and heart disease, are affecting increasing numbers of people. Infectious diseases are the greatest threat to life and health in modern Africa. Over two thirds of all deaths on the continent can be traced to infectious diseases, a rate twice as high as that of the world as a whole. The types of infectious illnesses range from tropical diseases such as malaria and sleeping sickness to sexually transmitted diseases such as AIDS. Newborns in Africa can expect to live, on average, about 50 years—some 20 to 25 years less than in most industrialized nations. Women and children are particularly hard hit by the lack of health education and access to health care in Africa. In many parts of the continent, family planning programs are either limited or nonexistent. As a result, the birthrate in sub-Saharan Africa is well above the world average. Although some nations (such as ZIMBABWE) have seen significant decreases in births, others (such as ETHIOPIA) have experienced increases in recent years. Among the poor, high birthrate is often associated with high infant death rates: about 15 percent of all African children die before age five. In addition, one out of every five African women dies from complications related to childbirth. Diseases of the industrial world are also becoming much more common in Africa. As a result of lifestyle changes, the amount of fat and salt in diets is increasing, as are the consumption of alcohol and tobacco. These are all risk factors for heart disease, cancer, and other chronic diseases such as diabetes. Also on the rise are motor vehicle and industrial accidents, which come with increasing levels of urbanization and industrialization. Unfortunately, the continent’s health care systems are not equipped to handle most of these problems. Doctors are in extremely short supply, and the vast majority of Africans have no access to hospital care—even those who do can rarely afford it. For these reasons, basic health care in Africa relies heavily on other resources. Far more people are treated by traditional healers than by modern clinics or health care centers, especially in rural areas. Modern health care is provided mainly by staff nurses, medical aides, and health assistants—not by professional nurses or physicians. 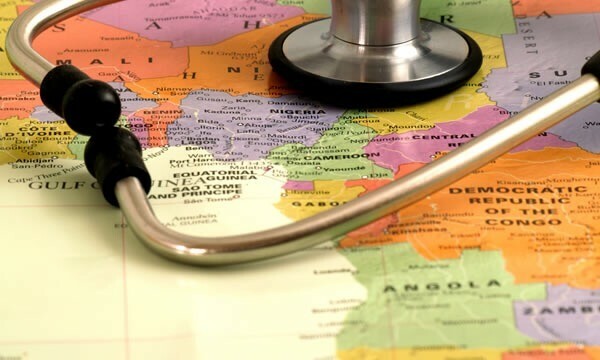 The World Health Organization (WHO) has developed a health care program to address problems faced by developing nations such as those in Africa. Much of the program’s focus is not on purely medical matters but on other factors that contribute to poor health. It stresses the prevention of disease by improving nutrition and providing safe water and basic sanitation. It encourages the control of disease through appropriate treatment and access to essential drugs. It also promotes health education, including information on family planning and the importance of immunization. Some of the efforts of WHO are aimed at changing social and political priorities. The organization is attempting to increase local involvement in health care planning and delivery, and to find ways for various sectors of society to work together to improve general health and safety. Funding comes from a variety of sources. Individual households provide most of the money for health care systems through their spending on health services. Governments also provide funding, although the amount they spend on health care is limited. In some countries, industry contributes significant amounts of money to health care. In ZAMBIA, for example, the mining industry pays for about one-fifth of all health care expenses. Foreign aid also helps fund health care in Africa. Some aid comes as direct payments to national governments, while some is in the form of programs set up to eliminate or control specific diseases. Christian missions also provide health care services, especially in rural areas. The health care system in Africa is basically hierarchical. Countries are divided into a number of geographical districts, each of which is served by a district hospital. The district hospital provides advice and assistance to various health centers, which in turn serve health clinics and community health workers at the local level. The basic level of health care in Africa is the clinic or dispensary. The staff usually includes medical assistants and staff nurses who have limited training and fewer qualifications than professional nurses. The clinics are generally involved in various local health care activities and give support to health care workers within the community. They provide the greatest amount of preventive health care in Africa. African health clinics offer health education, immunization, prenatal (before birth) and neonatal (newborn infant) care, and family-planning services on a regular basis. They also handle treatment of common complaints, refer more complicated or serious problems to a higher-level health facility, and often work on environmental issues related to health. Unfortunately, because clinics often serve isolated communities, they run the risk of being attacked in times of social unrest. In countries such as ANGOLA, LIBERIA, SOMALIA, and Ethiopia, small clinics have been destroyed and their staffs killed or threatened during civil wars. The next level up in the health care system, health centers, fill important functions in providing early treatment, improving nutrition, and lowering death rates. The staffs at larger health centers include registered nurses and medical assistants, but few have doctors, especially in rural areas. The centers have a few beds for patients and often have laboratory and dental facilities. In addition to patient care, health centers also keep track of health trends and collect health data. This data is used to guide the planning of district health programs. In some cases health centers are linked to university medical schools. The university staff trains health center personnel to work as a team to solve community problems with local participation. They also teach new generations of doctors and develop ways to expand the types of services that health centers can provide. These training programs have had a positive influence on the development of health centers throughout Africa. There are several levels of hospitals in Africa, but the most important are district hospitals. These are usually located in the small urban centers of basically rural districts. Although some district hospitals are badly understaffed and may have no doctor, an increasing number have more than one doctor and perhaps even medical specialists. The staff may also include newly graduated doctors from Western countries seeking to get medical experience in developing countries. Despite the presence of doctors, much of the work at hospitals is handled by medical assistants, nurses, and other health workers. Many district hospitals have developed strategies to deal with the lack of senior staff. Some have radio links with regional or national hospitals that can provide expert advice. Some are served by visiting doctors from higher-level hospitals who perform surgery or train the local staff. Specialized services such as dental, eye, and psychiatric care are often delivered by visiting physicians. Despite such efforts, district hospitals face numerous challenges. They often struggle with too many patients and too little money for maintenance or equipment. Their resources are strained by diseases such as AIDS, measles, severe anemia, and malnutrition. There is an urgent need for more community health centers to combat such problems before they overwhelm hospitals. Above the district hospitals are the regional and national hospitals. Regional hospitals usually have a variety of medical specialists who advise district hospital staffs and deal with serious cases from district hospitals. Even so, regional hospitals rely on nurses and medical aides to do most of the daily work with patients. National hospitals are the highest category of health care, but they have the least impact on national health. Located in larger urban areas, such hospitals are primarily medical research and training centers. The cost of care at national hospitals is more than most Africans can afford, and many of the doctors trained in them have no desire to work in the more primitive conditions found at district hospitals or remote community health centers. In addition, national hospitals are sometimes plagued by corruption, with patients having to pay extra to see a doctor, be put on a waiting list, or obtain needed drugs.